Deferred execution means that the evaluation of an expression is delayed until its realized value is actually required. It greatly improves performance by avoiding unnecessary execution. Deferred execution is applicable on any in-memory collection as well as remote LINQ providers like LINQ-to-SQL, LINQ-to-Entities, LINQ-to-XML, etc. In the above example, you can see the query is materialized and executed when you iterate using the foreach loop. This is called deferred execution. 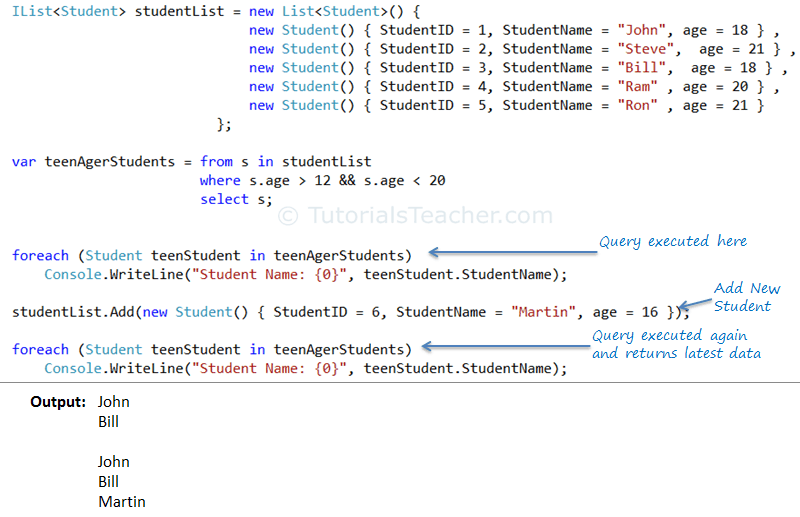 LINQ processes the studentList collection when you actually access each object from the collection and do something with it. As you can see, the second foreach loop executes the query again and returns the latest data. Deferred execution re-evaluates on each execution; this is called lazy evaluation. This is one of the major advantages of deferred execution: it always gives you the latest data. You can implement deferred execution for your custom extension methods for IEnumerable using the yield keyword of C#. For example, you can implement custom extension method GetTeenAgerStudents for IEnumerable that returns a list of all students who are teenagers. Notice that we print the student name on the console whenever GetTeenAgerStudents() gets called. As you can see from the output, GetTeenAgerStudents() is getting called when you iterate studentList using the foreach loop. So, in this way you can create custom methods using the yield keyword to get the advantage of deferred execution.